Like new, immaculately maintained, boathouse kept, one owner. New engine (275 hp 350 cu.in. 4 barrel Weber) 2012, new transom plate, hydraulic arms and steering gimbal 2018. Lower leg rebuilt so virtually new drivetrain and transmission (only 83.8 hrs on engine). 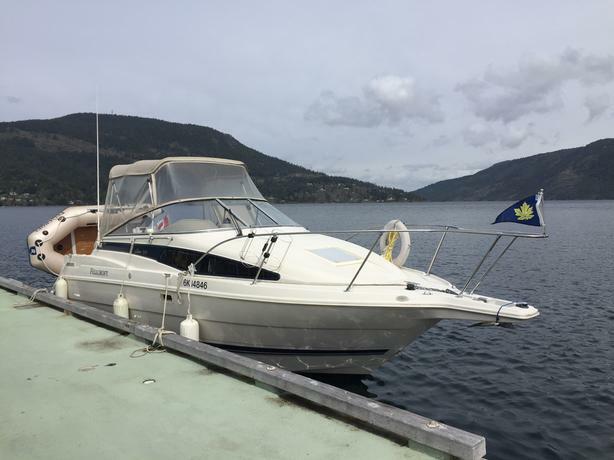 Complete with marine head, fridge, dual alcohol/electric stove, two double berths, Garmin GPS/chartplotter, Lowrance sounder with speed through water. Quicksilver inflatable included.